J’onn’s career as a dance instructor isn’t going well. Superman’s reason for not joining, because “my time is not my own”, doesn’t sit well with the team. Despite Flash being the one who wanted to invite him to join, it’s Hal who seems to be taking it the hardest. Superman also suggested that there might be other Appellaxians on Earth and Snapper figures out an eight meteor did crash down. 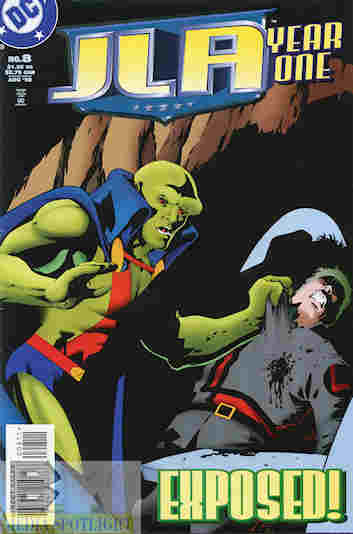 They can’t locate it at the crash site, but they get distracted from the mission when Snapper learns that J’onn is really the one who took on the forms of the people the others befriended in their secret identities and they are not happy. They also start wondering if he isn’t really the eighth alien, and he has to run off. What they don’t know is that Locus is planning to finally make their move, but one member tries to go to them for help, only to be shot by…Simon Carr, who is working for Locus! What they got right: We’re finally getting back to Locus mattering in this story. And it seems to be getting more interesting. What is Locus up to? We also follow one member who thought he didn’t have anything left, but in his last moments as a human he realizes maybe he does. It’s rather good. What they got wrong: Admittedly this one is personal preference and not anything wrong technically, but J’onn being the guy following them and betraying their trust just feels a bit wrong. I do remember there’s a good reason for it as we’ll see later on (and I hope it is good) but it seems to be there just to fracture the new team and a twist just to have a twist. I do wonder, and this is an actual critique, why they bothered showing us the Blackhawks returning to their classic uniforms instead of that lame attempt at an update they did that one time. It doesn’t really add anything to the story. Recommendation: The miniseries as a whole is good and most of my problems with this issue are personal preference. Plus it does set up the final events of the storyline. Give it a read. Posted by ShadowWing Tronix on December 10, 2018 in DC Spotlight, Yesterday's Comics and tagged DC Comics, DC Universe, Green Lantern, Hal Jordan, J'onn J'onzz, Justice League Of America, Locus, Martian Manhunter.